I tried to find some information on "direct-impedance amplification," but alas none could be located. 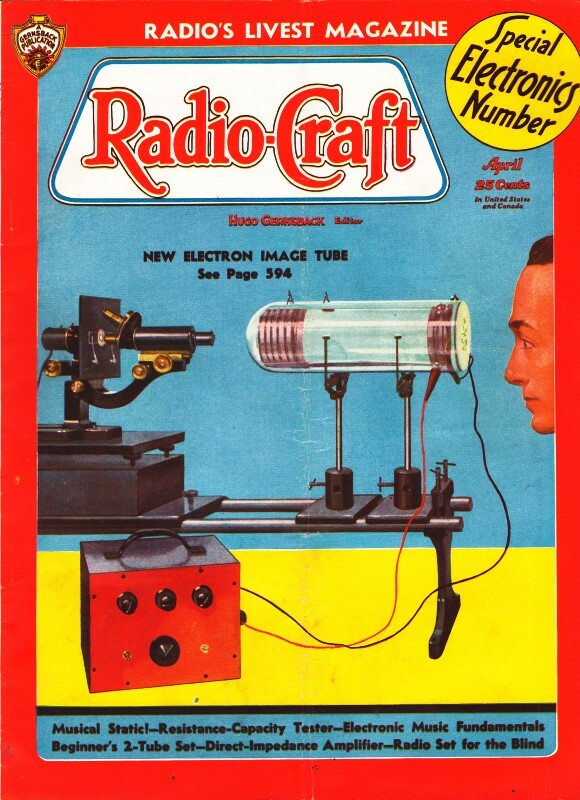 At first, I suspected that it being in the April edition of Radio-Craft might have meant it was a ruse on reders, especially since author L. Mitchell Barcus focused on the nearly sub-audible portion of the sound spectrum down to around 16 Hz. Careful reading of the article reveals, however, that his pièce de résistance was designing the circuit with a minimum of biasing resistors, capacitors, and inductors that might otherwise attenuate low frequencies. Success was in the form of direct coupling of stages sans Rs, Ls, and Cs. I'm guessing the technique was not adopted by the wider radio industry, except maybe for sound systems installed in aquariums where whales and dolphins could appreciate faithful reproduction of 16 Hz tones. Part II of this Direct-Impedance Amplification article appeared in the September 1936 issue of Radio-Craft, but unfortunately I have not acquired that edition yet. This is the first of a series of high-fidelity receivers which will interest the set builder. It is with considerable pride that this radio receiver is presented to the public for the first time. Designed especially in response to many requests for a receiver of moderate price, this circuit is the smallest and "easiest to build" of the series to follow. Here is an easily-constructed, low-priced radio receiver which will reproduce a 16 cycle note at a much higher volume level than the balance of the audio range! Fig. A - (in heading) the appearance of the three chassis of the set. Fig. 1, below. The circuit of the set with its three-chassis construction. In the design of this series of radio sets, all the problems of present day reception were taken into consideration. Primarily, the serious dropping off of frequencies below 70 cycles presents the greatest handicap to perfect reproduction. (The author discussed this point in a preceding issue of Radio-Craft. - Editor) It may be safely considered that no broadcast station of today transmits a 16-cycle note with even a near-approach to linearity compared with the balance of the A.F. range. The only satisfactory manner in which these losses may be retrieved is by employing additional amplification. The use of boosters or resonant tuned circuits, as in transformer coupled amplifiers, fails to achieve the ultimate corrective factors. Further, all other amplifying systems themselves face the same attenuation of the low frequencies and these resonating circuits at best barely make up for their own inherent overall losses. In the set described here, the exclusive "direct-impedance" circuit offers amazingly level response over the entire A.F. spectrum. Thus, given a practically flat 16-cycle output, the additional pentode amplifier stage brings even weak low notes up to a satisfactory level. It is this almost unbelievable performance in the lowest frequencies which gives the set its characteristic mellow depth heretofore unobtainable. "Tuning Out" Individual Musical Instruments! The importance of the low-frequency response, unbelievable as it may appear, is often not so much in the reproduction of the two bottom musical octaves, although these determine the entire character of an organ, as in the bringing out of the background noise to which we are accustomed in life. As an example of this we may, on the larger models which incorporate a low-frequency volume control, cut out the low response on a xylophone solo. While we have thus attenuated the lows below the effective range of the instrument, we still have the normal high-fidelity performance of contemporary radio receivers, a lifeless though accurate reproduction. By restoring the background, which may sound only like a series of soft thumpings and indefinable noises, the solo assumes a solid and convincing reality completely unlike the bare music. To many, having never heard a low note on a radio set, the effect of the two bottom musical octaves is almost inconceivable. The entire depth usually associated with an organ is dependent on these vibrant notes and their absence alters the rich, soft music to the thin, piping effect normally heard on even the best of radio sets. Should it seem that the construction of this receiver is difficult, it may be well to bear in mind that actually it offers fewer problems than many conventional sets. Both power units are extremely easy to build, being little more than 2 speaker-field supplies. The receiver itself is most conventional and is not designed to offer 'round-the-world reception 'and other features of no consequence to high-fidelity reproduction. The incorporation of some method of visual tuning indication is of value to builders who do not object to the slight additional expense. The usual 2nd I.F. stage has been omitted to cut down background noises and to offer less side-band cutting. While the variable-coupled type of I.F. coils have not been specified in this receiver, their use is not objectionable. It is by no means fatal to vary the layout given in the heading illustration. As shown, however, there are several basic principles to which the builder must adhere. In the receiver unit, for example, it may be noticed that the power transformer (L) occupies the left corner with the 2 filter chokes (J and K) ranging along the left end. This placement segregates the power supply from the balance of the chassis, especially the two A.F. chokes (G and H) which may be seen behind the tuning condenser. The units in the heading photo correspond as follows with the symbols in Fig. 1: 1-V1; 2-V2; 3-V3; 4-V4; 5-V5; 6-V8; 7-V6; 8-V9; 9-V7; 10-V10; A - aerial coil; B - R.F. coil; C - C2; D - oscillator coil; E - first I.F. transformer; G - Ch.1; H - Ch.2; J, K - Ch.3 and Ch.4; L - Pt.1; M - Pt.2; N - Ch.5; P - Pt.3; R - Ch.6. The mention of induced hum naturally calls for added discussion of that phase of construction. In view of the tremendous low-frequency gain of the amplifier, it might seem that the elimination of hum would be a serious and difficult obstacle, but such is not the case. It is unnecessary to purchase heavily-shielded A.F. chokes to arrive at completely hum-free performance. The fact that considerable current is flowing through the windings limits the inductive pick-up. The uninitiated constructor would very likely connect units 1 and 2 with a 4-wire cable. Nothing could be more disastrous to humless performance. It is always essential that the plate-to-grid lead be separate from the rest of the cable, but may be wired to the same plug and allowed to hang loosely from the cable. The low-pass filter which precedes the final 2A5 is so adjusted as to pass only notes below 70 cycles, to any extent. As shown in the diagram, it is composed of (a) a small A.F. transformer with the primary shunted and (b) a bypass condenser of unknown value. This transformer is usually one of the low-priced universal replacement units of about 3-to-1 ratio and the condenser varies in value depending on the set-up used. It frequently has a value of about 0.25-mf., but may vary from this value to as high as 0.5-mf. or down to 0.1-mf. In addition, a condenser is placed across the output transformer to resonate it to these low frequencies. This, too, depends on the speaker. The correct value for maximum performance is found by experimentation. It usually runs from 0.5- to 1.0 mf. Sockets, speaker plugs, chassis, etc. Three Sylvania type 80 tubes, V8, V9, V10. *Name of manufacturer will be sent upon receipt of stamped and self-addressed envelope.